It was an art project satirizing the exclusivity of foodie culture. For a few #blessed days, Lura Cafe was the hottest new restaurant in Providence. The bright, cozy farm-to-table joint hid in plain sight next to a downtown parking lot, steps away from the Rhode Island Convention Center. Lura would be a refuge for diners in the know, serving modern takes on cafe classics—all local, all organic, all certified GMO-free. It was upscale and casual, timeless and avant-garde. It had a vaguely Nordic air of refinement. It announced itself—as all similarly accoutred restaurants must—with a social media blitz, featuring sans serif lettering, sunny high-angle shots of brunch dishes, even a breathless write-up in the New York Times. It was also totally fake. When Lura Cafe “opened” on October 18, visitors were greeted not with avocado toast and bruleed carrots but with a manifesto: “’Lura’ is a statement project targeting the rising phenomenon of the elitist subculture of foodies.” Beside it, a translation of “Lura”—“Swedish for fool, trick, deceive, lure, cheat, befool”—and a call to arms: #stopfoodies2015. The satire wasn’t exactly subtle. In the days leading up to Lura’s grand opening, the restaurant’s Facebook page taunted followers with a surreal menu of “home-cut potatoes … wrapped in authentic New York Times newspaper,” “cold brew coffee served … over mineralized water rocks,” and “10x washed quinoa salad.” The quote attributed to Pontus Wikner, “POTS SEIDOOF,” is “FOODIES STOP” backwards. 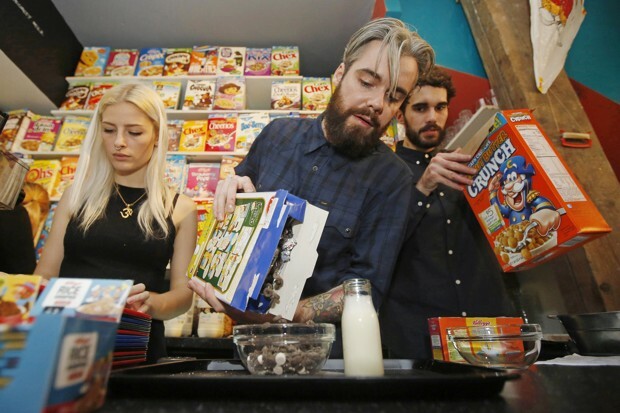 How a London café specializing in cereal became a in the city’s gentrification debate. Watching the storefront on opening day, they noted a consistent profile in the passersby who paused at the installation: Beards. Glasses. Tattoos. Flannels. Hipsters—for lack of a better word. “We could tell who came specifically for the event,” the artists said. And, peering past Lura’s clean, minimalist window dressing, these curious foodies found overturned chairs, gaping refrigerators, a beat-up cash register, dust on the floors. The doors were locked. Foodies are an easy—and frequent—target of this line of cultural criticism, but Lura’s message hit particularly hard last week, coinciding with a public debate between editors of the New York Times and New York magazine over the ethics of restaurant hype. But that conversation, unfolding primarily online, was itself a form of media navel-gazing—food insiders talking to each other and wringing their hands over the existential purpose of their work. It didn’t touch on the socioeconomic consequences of the pursuit of “good” food—which Lura’s location points up in a very real way. Lura was installed on the facade of a shuttered business called Coffee King, a “little shed with two tables and a handful of window seats,” according to Yelp reviews, where “the owner knew everyone who came into the store.” The no-frills breakfast spot closed months ago and remains vacant to this day; that’s why it was available to the artists. It was a neighborhood place—“like Monk’s for Seinfeld,” wrote one Yelper—that didn’t fit the mold of third-wave coffee shops, wood-fired pizzerias, and luxury apartments cropping up in Providence’s Downcity. (The Providence Journal building, directly across from Lura, will soon house more than 10,000 square feet of restaurant and retail space.) And while the Lura installation is gone now—the window text was torn down just a few days after it went up—the royal blue “COFFEE KING” awning remains, hovering like the ghost of the city’s working-class past.